According to global research from Booking.com, one of the world’s largest travel commerce companies and a digital technology leader, 75% of women in tech in India, highest globally feel that gender diversity is a top priority for the industry; and only 26% feel that their company does not prioritize gender diversity enough, compared to the global average of 54%. However while initiatives to close the gender gap and encourage more women into tech are having some success, tech companies and the industry need to demonstrate greater commitment to nurturing female talent – not only those considering or starting a tech career, but also established experts in the field. Encouragingly, these programs are empowering women with the skills and support they need to progress. 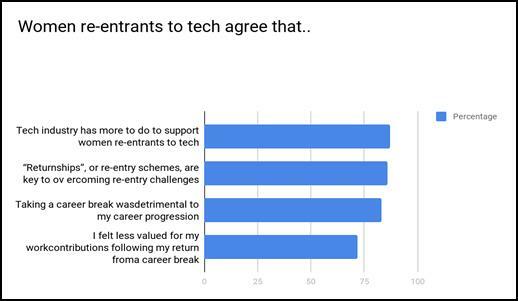 In fact, 81% of re-entrants say they had access to a mentor upon their return to work – something women in tech identified as essential to their career success. 88% also say their company helped them update their technical or other skills following a return. These figures are highest globally. The latest World Economic Forum Gender Gap Report* found that there is a widening inequality gap worldwide. Yet, women are making strong contributions across all aspects of business. When asked about the benefits that increased gender diversity can bring to the tech industry, 94% of women in tech in India – and those students interested in pursuing a tech career – said they would help diversify the sector, bringing fresh perspectives, backgrounds, and experiences. They also cited greater flexibility in HR benefits (92%) and an improved work environment that would benefit all employees (91%). Beyond these cultural benefits, women increasingly feel their representation in the tech workforce will contribute to improved company and brand reputation (93%), as well as trust in tech companies in general (92%).